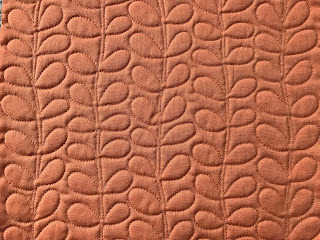 I bring a bunch of quilted swatches to my classes to demonstrate different ideas and students really love seeing this particular series. They're bits of fabric straight out of my stash that work great for FMQ practice. 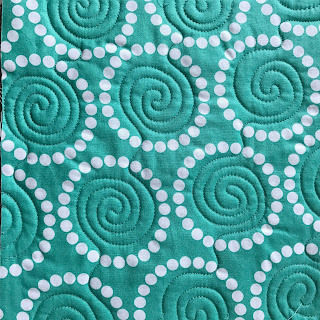 When I was starting FMQ I knew I wanted to practice but I didn't know on what. 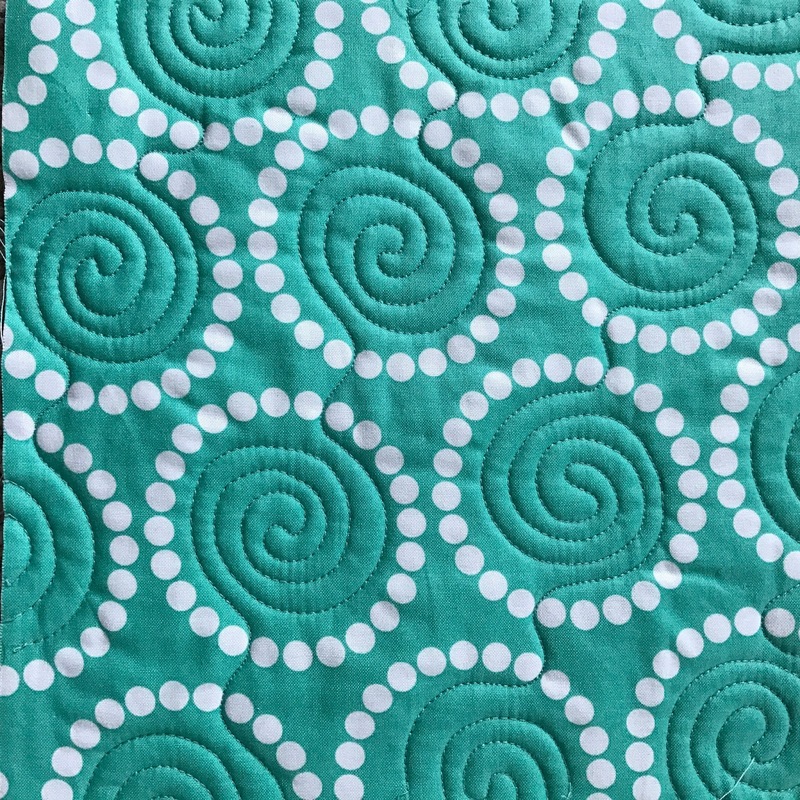 Using fabric that's already in your stash as your base can get you out of the deciding mode and into stitching mode where you can improve your eye hand coordination and your stitch length. These are the things that you need "practice, practice, practice" to get better at! Take a look at my examples and see if anything catches your eye. 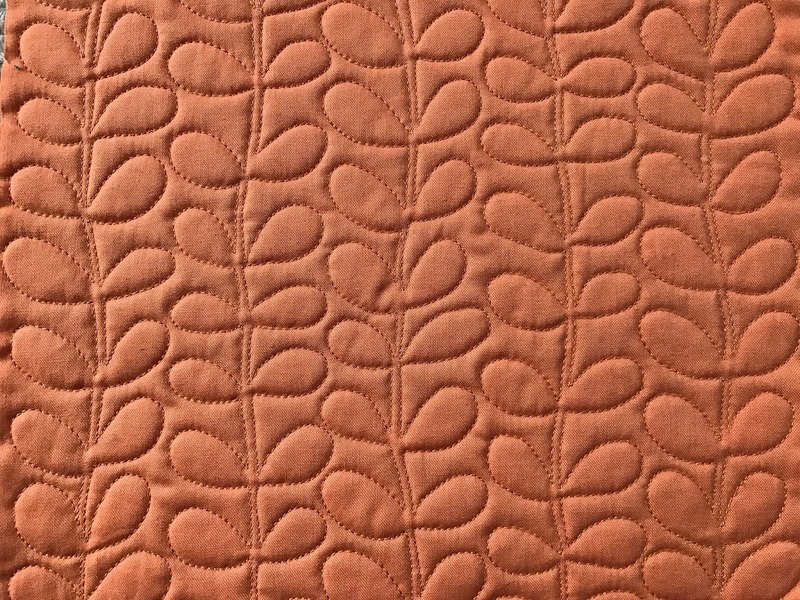 You probably have some vines in your stash: what if you just quilted right on the edge of the pattern? 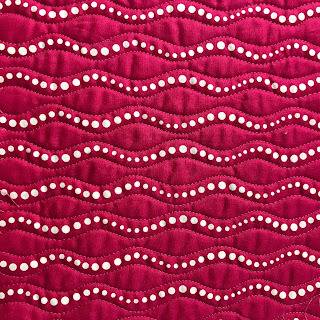 Up one side and down the other: this gives you practice working both "forward" and "backward" which is helpful for improving your FMQ. Bonus: look how great the back looks! 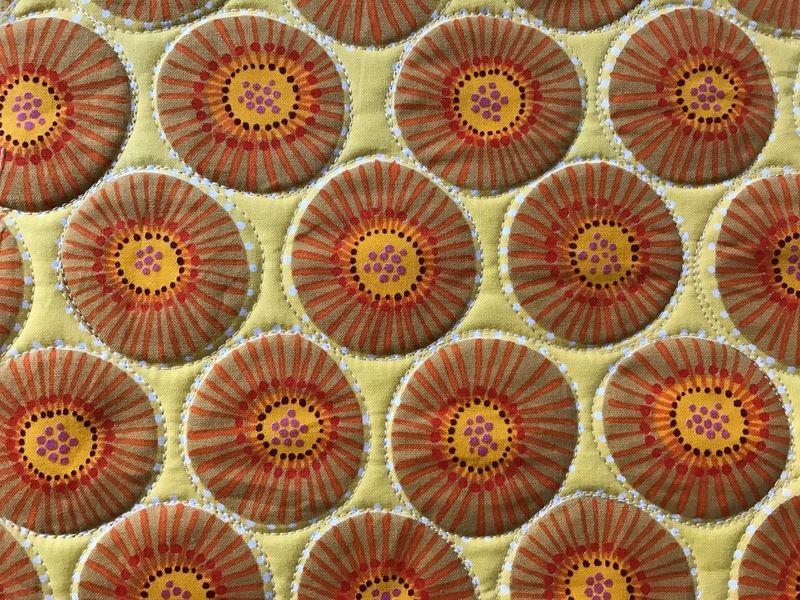 Here I've got big circles that I just quilted like giant pebbles. If you're working with large circles like I do here, you'll get to practice making smooth sweeping movements and keeping your speed consistent as you go around a curve. 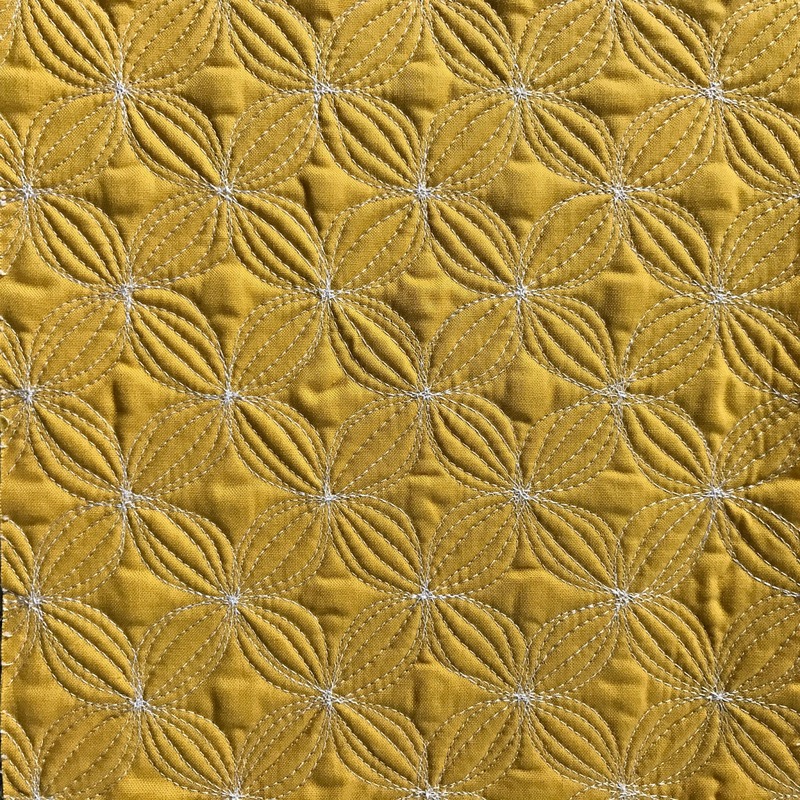 I chose this fabric because it had so many lines, I thought it would be great for eye hand coordination. 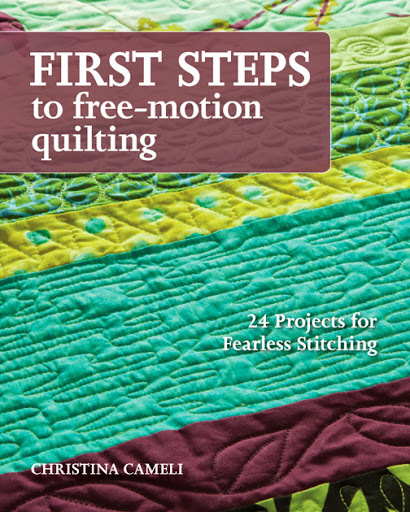 With so many passes over the same area, you get a lot of FMQ practice in a small area! And what a great texture on the back! Even simple wavy lines can be a source of practice: here the challenge is on keeping a consistent distance from the design you're following. 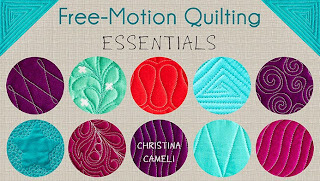 This is great if you like to echo quilt (I'm looking at you, Appliqué Nation!). Now what if you made the wavy lines and then filled the empty space between them with pebbles or lazy eights? Some fabrics will give you practice filling in a space. Here I used some Pearl Bracelet fabric and filled each bracelet with a spiral. Remember to leave yourself some space to get out of your spirals! To get to the next bracelet I just snuck out between two pearls and into the next one the same way. Anything with large blocky areas can be used to practice space filling as well. You could try different designs in each distinct area or just work on getting your stitches consistent. In this sample, whenever I ended in a place that wasn't adjacent to where I wanted to stitch next, I just stitched right along the edge between the ares over to where I wanted to be. This is good practice for travel stitching! 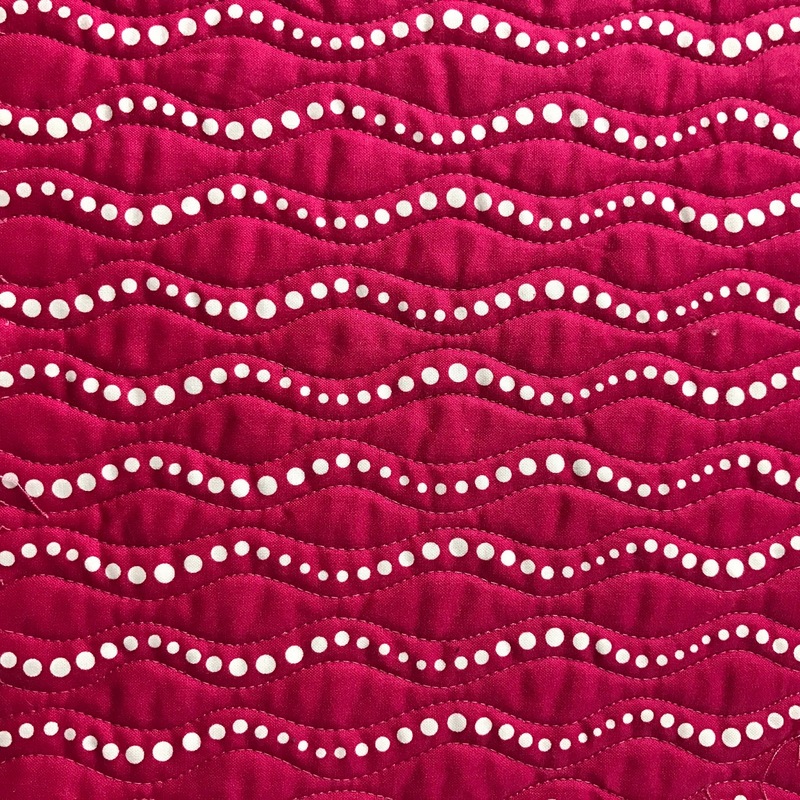 If you need a little FMQ practice, shop your stash, cut a piece (about 12-14'' square is ideal) and sit down and quilt it. 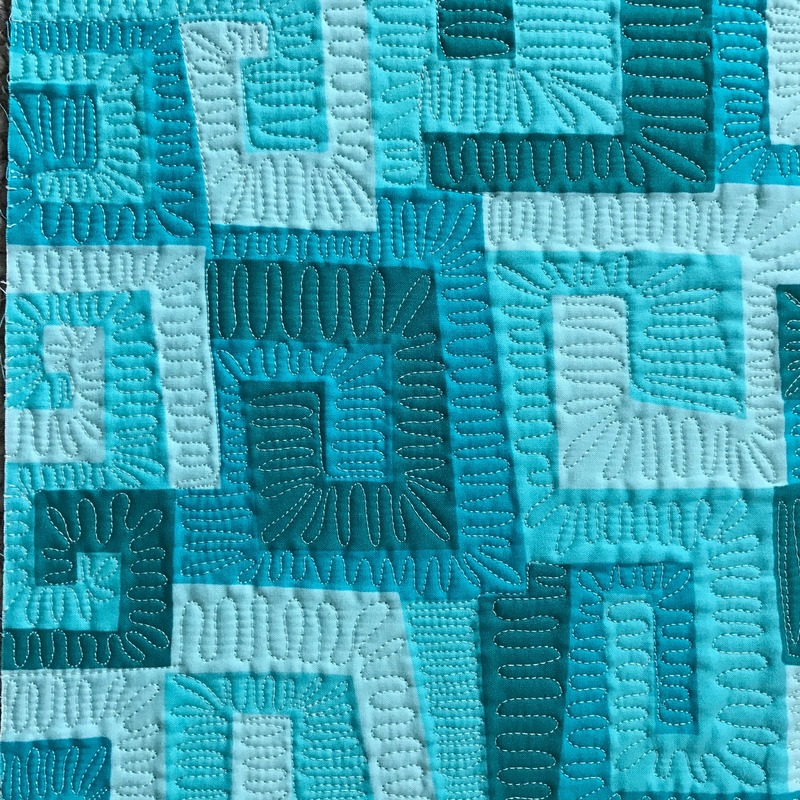 Don't stop in the middle to decide if it's good or not, quilt the whole thing! It always looks better after it's finished, and repetition is the best way to learn a new skill. Happy stitching! This is a terrific idea, and a great way to use the older pieces in the stash. Thanks, I will have to try it! Excellent idea! I tried using my fabrics but not in this way -- time to change my habits. I love this idea! I will certainly use it! 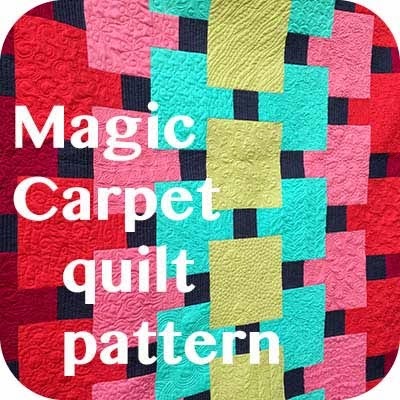 This must be the very best way for me and so many others I'm sure to practise our FMQ . Follow the fabric design, a super innovative way to learn and better the skills.Thank you so much for this. Great idea! Thanks for the examples. So much fun! I am going to look at my stash differently!! I have been procrastinating, but lately started practicing on small bits with a project in mind (I had to do this in order to get over the 'hump' of 'wasting' fabric). Now I have some gorgeous baby bibs to give to a friends recent new grandchild. I have also quilted my fabric before making fabric boxes (I use 'Hearts and bees' '1 hr basket tutorial - but only quilt the fabric and batting - the liner is then sewn separately) to give away as gift receptacles (great for soaps, candles etc). Thank you for all your great ideas: I have some border fabric that just popped into my head as a great tester. I love reading your posts! Great samples and tips, thanks so much! That is a great plan for practicing. 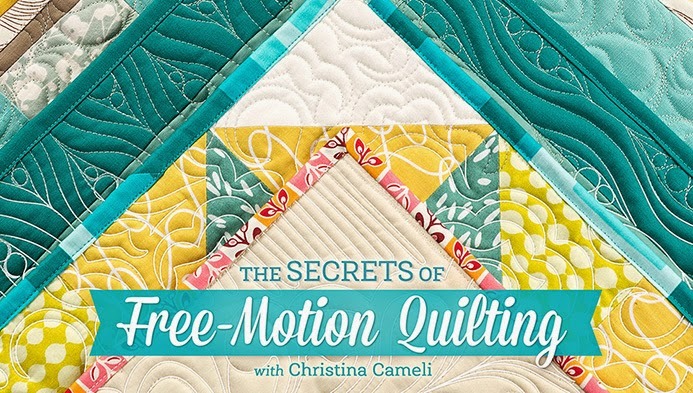 I need to do that when I am "between" quilts to keep my skill level up to par. Genius!!! 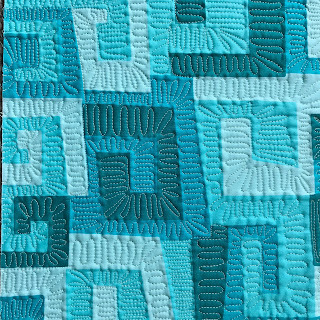 My stash has been looking overwhelmingly "busy" ever since I embraced the modern quilting movement. Now I can "consume" more prints and make room for more solids! Thanks. Oh, and those quilted bits are welcome at pet shelters if bound. I use leftover binding scraps too! 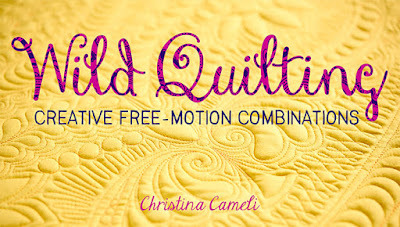 I love your examples - and especially showing how to quilt prints - as i love prints and have tons of these in my stash! 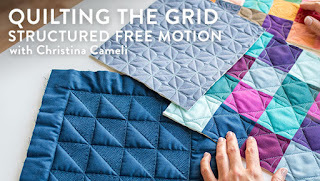 It seems modern quilting is all about solids or solid looking fabrics - but I still love my prints! They will make great small projects like bags and aprons, and will make good practice pieces for FMQ. Thanks so much for generously sharing more of your fantastic, creative ideas. Gee--never thought about using stash fabric! What a great idea. Sure does beat plain ole muslin. What a great idea. I have some crazy patterned fabric that would be great for this. This gives me a new way to look at my stash! 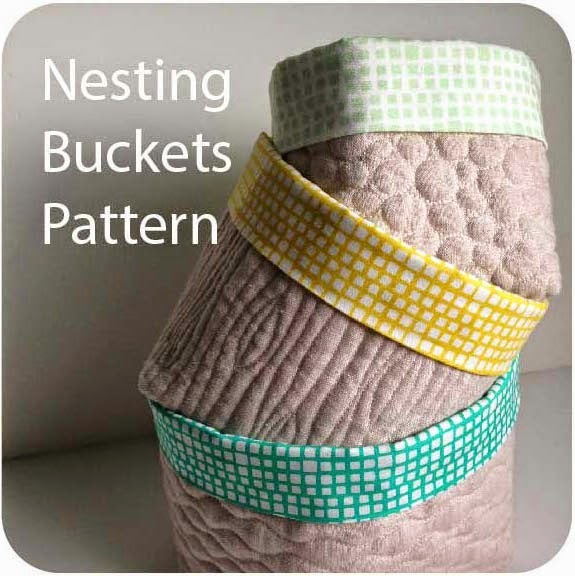 Great idea for FMQ practice! What a great idea Christina! The beauty is that you don't have to worry about messing up a pieced work. 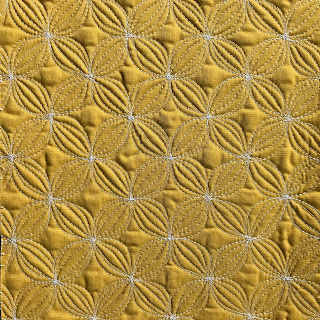 And if you do it well, you end up with a fun piece of quilted fabric that you could use to make something cool. I can see why your students get excited when they see these samples! This is brilliant! I am going to do this!